This stunning rural holiday home will capture you heart with the creature comforts it provides. The house is completely self-contained but the special treatment shines through as you are treated to lush linens, a gorgeous free-standing bath and a gourmet breakfast basket with homemade and local provisions. Do what the locals do and try Fly Fishing from 28 Gate’s well stocked lakes for a champion rainbow trout! Take a stroll on dusk and try to spot all of the native animals: wallabies, possums, wombats, echidnas, Tasmanian Devils and 28 Gates own resident platypus! 28 Gates is a stunning two-story house that will host families or friends wanting to experience Tasmania and it’s natural wonders. The boutique house sleeps up to six people, with three bedrooms, two bathrooms, two living areas and a fully appointed kitchen where you can cook a hearty breakfast with the hamper provided. 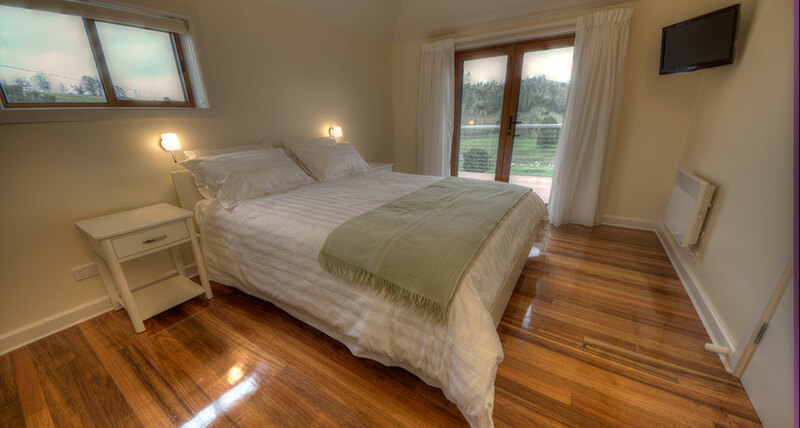 The charming house is fit for luxury and relaxation with polished floors made from Tasmanian timbers, comfortable leather sofas, finest bed linen, cosy wood-fire and a free-standing bath which looks out to a clear country sky. You are surrounded by a vast amount of native wildlife to discover. There’s something so lovely and humbling about sharing your stay with 10,000 sheep on this amazing 5000 acre property. 28 gates is a boutique luxury in Tasmania's Derwent Valley, one hour's drive west of Hobart, Tasmania. The closest town is New Norfolk which is a 30 minute drive. It has a supermarket, chemist, bottleshops, library, restaurants and many antique shops and cafes to explore. A three bedroom house with two queen beds, and one king bed which can be made up as two singles if requested at time of booking. Two bathrooms. Full breakfast provisions including free range eggs, bacon, smoked salmon or trout, mushrooms, tomato, yoghurt, fruit, milk, home baked bread, spreads, cereals and apple juice. We welcome all ages and can provide a portacot. Please note: this property requires a $200 bond, which must be arranged directly with property owners prior to guest arrival.